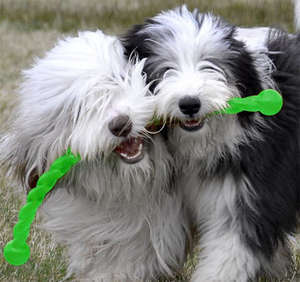 Kong SafeStix are great fun for your dog to fetch and retrieve and are a whole lot safer than a real stick. Dogs love to play with sticks, however they can damage a dog’s mouth, teeth and gums. KONG Safestix offer a long, bendable, flexible, fun and safe alternative. Kong Safestix is the ideal year-round throw, retrieve and tug toy and is perfect for outdoor and indoor fun. Their vibrant colours make them easy to spot on any outdoor surface from grass to snow, they float and are great for retrieve, play and training at the beach or river. They are also a fun indoor tug toy. Kong SafeStix are durable, simple to throw and easy for your dog to pick up. Made from durable thermoplastic rubber the Kong SafeStix is safe and gentle on a dog’s mouth. Kong Safestix have a twisted surface for an easy grip and the bulbous ends provide an additional safety feature, offering owners a good grip too for games of fetch and tug.